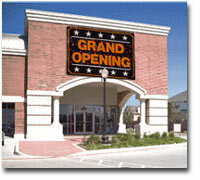 Draw a crowd with full color digital graphics from InstantSign. We can help you create graphics and signage that will generate excitement, provide directions and create colorful backdrops for all of your settings and events. Colorful banners draw attention from a distance, promoting special events and appearances. They also serve as interesting backdrops. Use big, bold custom banners to generate excitement at special events. InstantSign is a free-standing, vertical-banner display that lets you promote products, programs and special events virtually anywhere. Easy-to-read signage helps direct traffic, control parking and direct patrons inside and outside a destination. Window lettering makes a positive impression as people enter your facility. Use them as directional tools, aisle or stage markers or even as advertising for a new event. An attractive, well-organized menu board promotes sales of food, beverages, and memorabilia - and keeps the line short by helping patrons make their choices before they get to the window. Meeting OSHA sign requirements helps protect both employees and patrons throughout your facility. InstantSign can design and coordinate your complete trade show exhibit system, including full color graphics and convenient, shippable carrying cases. compliant directional signs and graphics. Banner programs build attendance throughout the year. To keep your marketing message fresh, hang a new promotional banner each month. Studies have shown that people tend to ignore what has become familiar, but a fresh new look reawakens their interest.